The name of the new Pro Art conversion set for Tamiya Humvee can be a little confusing, as actually both Tamiya kits are already hardtop variants. 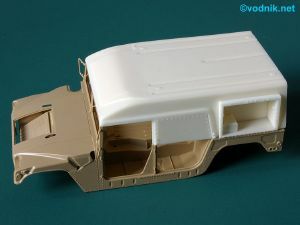 What this set depicts is in real world called Helmet Hard Top conversion and consist of fiberglass hard roof and two storage compartments on sides (in most common version, as there is also one without storage boxes). It is used with soft top Humvee variant (e.g. M998) to provide crews with better protection from the elements. Please note that there is no information about the "target kit" of this conversion set on the box and it's not even on Pro Art website. 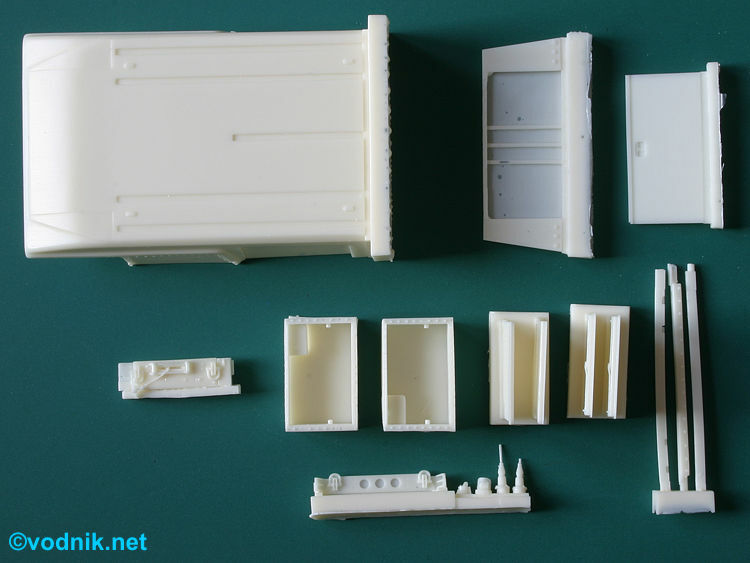 But the set is definitely designed for new Tamiya M1025 (well, actually it is already a year and a half old!) 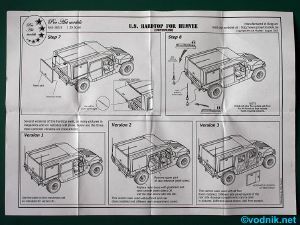 or M1046 and considering dimensional differences between Tamiya and other manufacturer's Humvees (including Italeri Humvee sold by Tamiya in M242 Bushmaster armed variant) it would most likely not fit to any other kit. 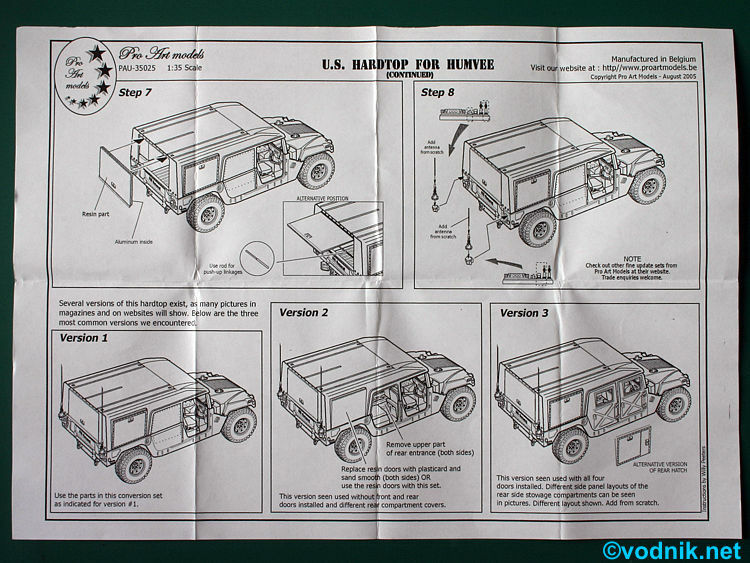 Actually if you read the instruction sheet carefully there is a reference to Tamiya kit instructions in a small print under Step 1 illustration, but that's all. Inside the small hard paper box, filled with protective styrofoam chips, we get one plastic zip-bag with 18 cream resin parts and double sided A4 sized instruction sheet. Construction steps on it are clear and easy to follow. Resin parts don't have numbers assigned, but as there is relatively few of them it is no problem at all to identify each of them. The largest resin part is fiberglass roof - cast integrally with upper part of rear doors fillers. The walls of the storage compartments and the rear shell wall are separate. Also separate are side storage compartment hatches, large rear hatch, lower parts of side back door fillers and three support beams for the bottom of the roof. Additional parts included in the set are two antenna bases, front bumper and winch. To fully detail the model, you need to do some scratch building - four small lifting eyes / tie downs have to be added on top of the roof. Their positions are clearly shown in instructions, but their exact size is not given. In case one wants to show rear hatch or storage compartment hatches open the support linkage or thin holding wires have to be added. 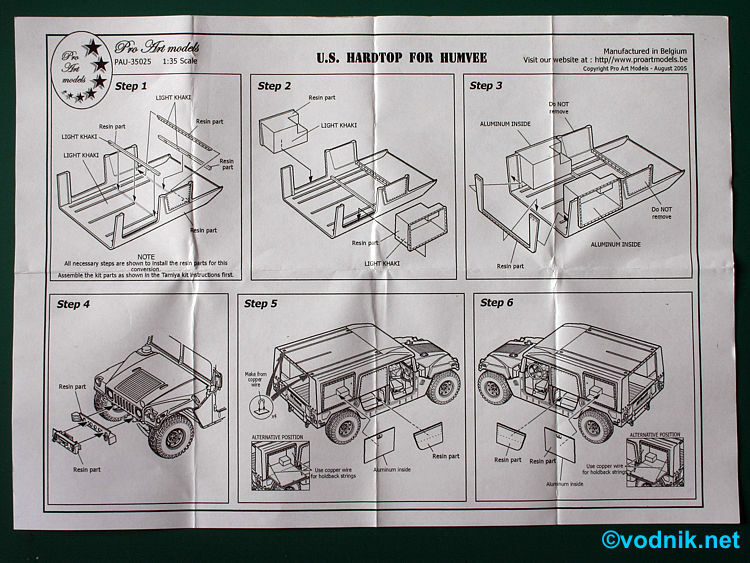 The instructions show three possible configurations of Helmet Hard Top Humvee. First one can be build from the conversion set without any modifications. 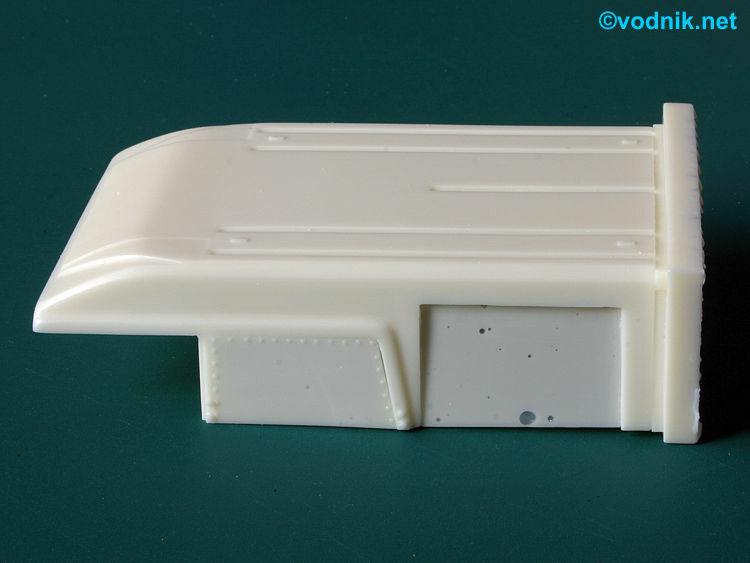 The second variant is one without the side storage compartments and to build it modeler must use a sheet of styrene or modified resin hatch pieces from the set to make smooth side panels. 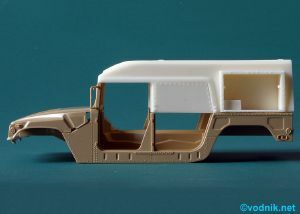 One note - to build this version correctly, the whole storage compartments must be removed enlarging the space available inside the vehicle. The problem is however that in Pro Art set the internal storage compartment walls are cast integrally with the rectangular frame protruding from the side of the fiberglass shell. So to build accurate version without storage compartments, modeler would have to cut resin parts carefully to separate inner compartment walls from raised outer shell frame. The other, possibly easier option is to simply scratch build new frame from strips of styrene. In this version Pro Art instructions also show that the side door fillers can be removed from fiberglass shell part and model can be build without side doors or with all four kit doors attached. 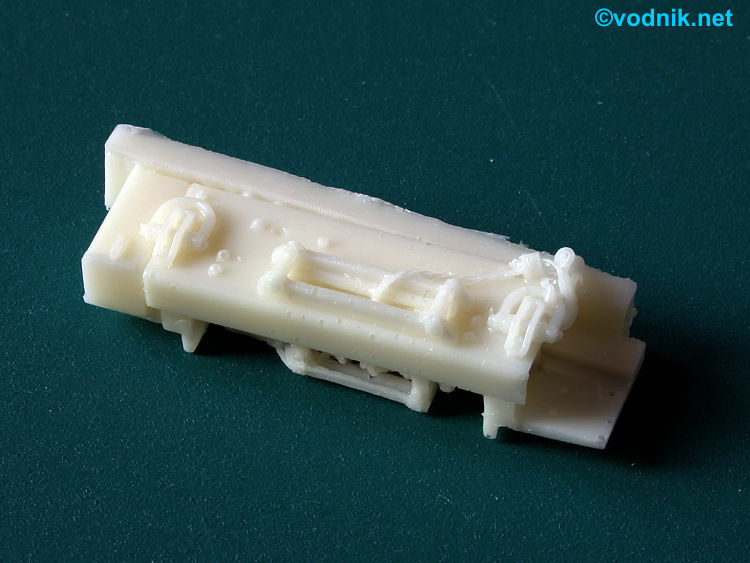 The third version shown in instructions also has all four original doors (basic variant, as these provided in M1025 kit) installed and alternative style hatches for storage compartments are shows. 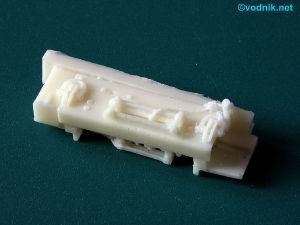 These hatches however are not provided in the set and have to be scratch built. Click on picture to enlarge it. Instructions page 2. Resin parts are well cast with no flash, and only a couple of small air bubbles. The only problem in my set is that a lot of bolt heads have broken off from the storage compartment frames (or maybe were not cast properly at all). They should be easy to replace with styrene rod pieces, but it is some extra work. The support beams for the roof are very slightly warped. All parts are included in the set with their resin casting blocks attached, but removing them shouldn't be difficult if only some care is taken and proper tools are used. Some bigger parts have large openings in them filled with resin film that has to be removed, but it is quick and easy task. Click on picture to enlarge it. Large Helmet Hard Top part. Main parts dry fitted to Tamiya model parts. Click on picture to enlarge it. Main parts dry fitted to Tamiya model parts. I dry fitted hard top parts to Tamiya kit and they fit perfectly. At first sight the Pro Art Helmet Hard Top looks the part, although I had a feeling that the roof is just very slightly too high. When I carefully compared the resin parts to photos of real vehicles I was able to confirm it - the Pro Art roof is indeed a bit too high. The front part above driver's doors seems to be more streamline in real thing when viewed from the side. Most noticeable however are wrong proportions of the storage compartment hatches. In real thing they are quite "flat" - they are twice as wide as they are high. The kit part is much higher - the width is only about 1.5x of height. These inaccuracies however are only noticeable when you compare parts to photos directly, or you are very familiar with the real vehicle. I have some doubts about the accuracy of the front winch configuration included in the set. I have seen several different front winch types, but never seen the which attached on the front bumper, as is shown in Pro Art instructions - all were attached instead it. While I can't be sure that it is indeed wrong, it looks very suspicious for me... The resin winch part can however still be used, as it is nicely cast and detailed - simply ignore the bumper part and attach the winch directly to the kit suspension frame. Despite some small shape problems, it is a very nice set. It enables modelers to build now very common Helmet Hard Top version - often seen in the US, Europe or in Iraq. 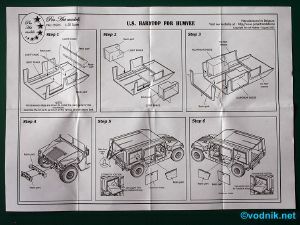 Humvees used in Iraq often have the weapons ring attached in the hole cut in the roof of Helmet shell and building such version should be relatively simple using modified pieces from Pro Art set and original M1025 kit bits. 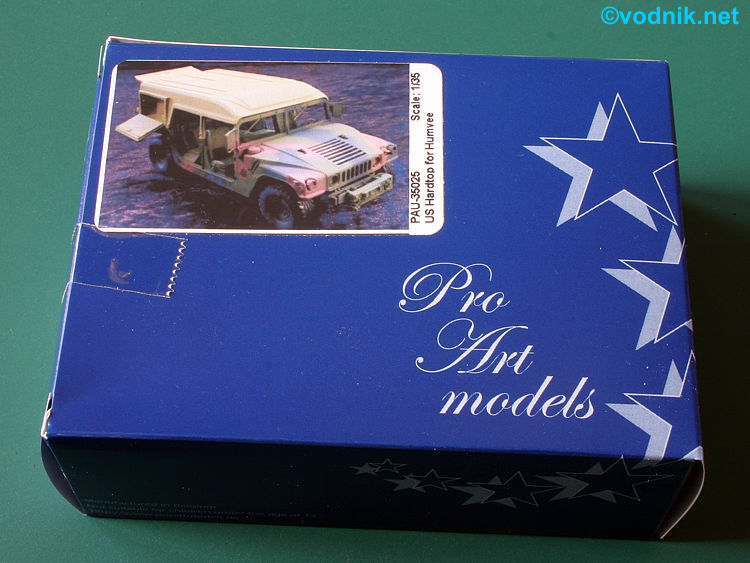 Many thanks to Dirk Vangeel of Pro Art Models for the review sample!